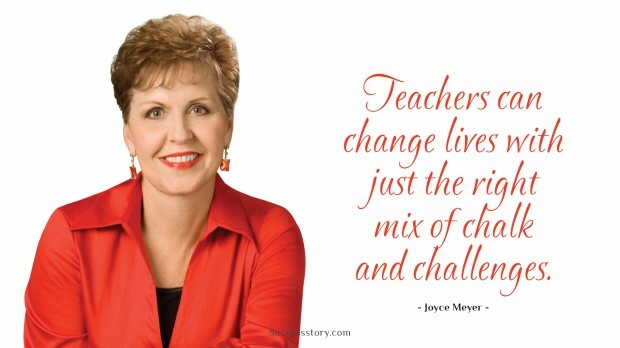 Joyce Meyer was born on June 4, 1943 as Pauline Joyce Hutchinson. She is one of the most charismatic and influential Christian speakers and authors. With her headquarters based in Fenton, Missouri, Meyer lives with her family near St. Louis. She’s a graduate from the O’Fallon Technical High School and married a car sales man. The marriage did not last long for the man would often cheat on her and also persuade her to steal money from work. Joyce had confessed it herself and had also returned the money after several years. "When you are tempted to give up, your breakthrough is probably just around the corner." "Teachers can change lives with just the right mix of chalk and challenges."